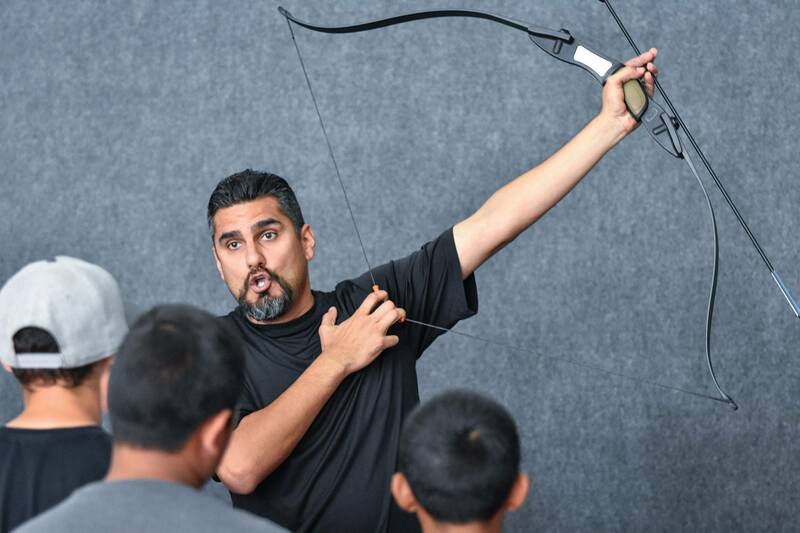 Gabriel Lazo is trying his best to not be hit with an arrow. It is Lazo’s first time playing archery tag, and he is the only one left on his team. Out numbered two to one, he does his best to hide behind a barrier and dodge incoming fire while trying to take his own shot. Arrows hit the barrier, fly over his head and barely miss his legs as he aims. His shot misses its mark. Then his opponents rush him from two sides. Lazo tries to fire back arrows as fast as he can but runs out. Trying to reload, he is shot in the leg. It is game over. During the week, a hangar at Brackett Airport is reserved for the Pacific Juniors Volleyball Club, but during the weekend it undergoes a transformation. The floor looks like it is still set up for volleyball, with three full-sized courts outlined in orange and blue tiles, but paintball-like barriers and netting are put up for a different kind of game. Two teams are lined up, waiting for a whistle. When it blows, the players spring for the center court, Hunger Games style, trying to grab as many arrows as they can for their team. 2120 was the idea of La Verne residents Vincent Amaya, 36, and his wife Andrea Amaya, 37. 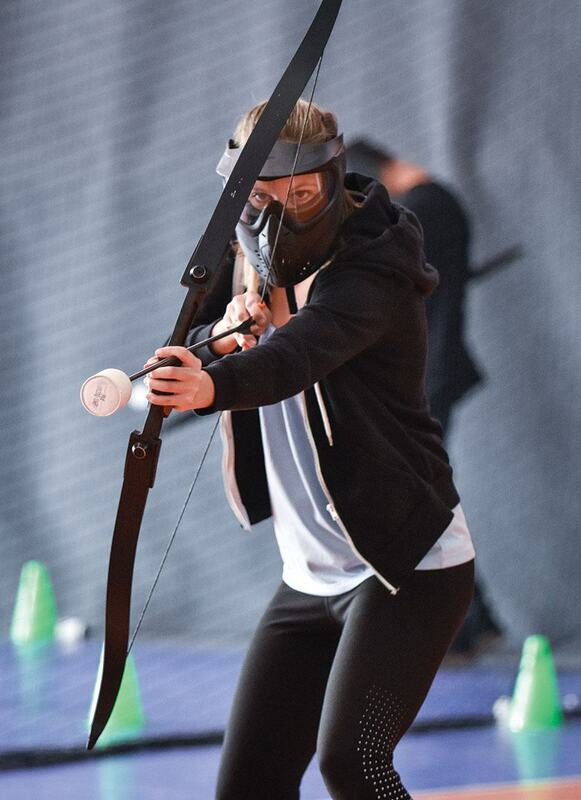 In May 2017, they opened the archery tag party contests that combine traditional dodgeball with the skill of archery. For three months prior to opening, they tested the equipment. 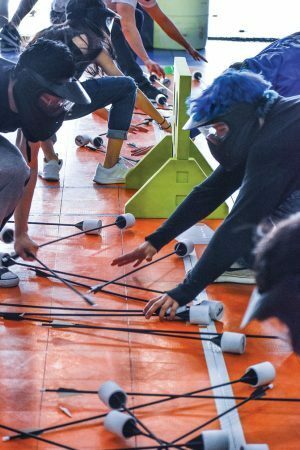 Even though the arrows are tipped with foam, the Amaya’s wanted people to be safe; one must wear a paintball-style mask when playing. All of the other materials were scrutinized, from the arrows to the plastic bunkers that provide players with cover during the game. Vince and his wife are both reside in the city. Their four children, Madison, 17, Vince Jr., 17, Brooklyn, 10, and Kyra, 8 all attend either La Verne Heights Elementary or Bonita High. When starting 2120, the Amayas’ had a vision of how the company would grow. They planned to expand from La Verne outward, but totally the opposite has happened to date. In their first few months, business was slow. Vince says they targeted La Verne’s Fourth of July parade in a big marketing pitch. They say they were well received on the parade route, handing out 3,000 vouchers for free games. Of the many fliers distributed, Vince says five people redeemed the coupon for a free game. “That was a big flop,” he says. Nevertheless, he tried a different direction. “What helped us grow was Groupon. That is big for us; however, as a small business, financially, it’s not the best option.” Vince says that while Groupon does get people in the door, it takes 40 percent of the online sale. They do like the traffic it has created, but they simply cannot sustain the business on the percentage. Groupon attracted people from the surrounding areas of Rancho Cucamonga, Ontario, Riverside and even Monterey Park. The goal was to get La Verne first because they want to service their home city. Yelp has also had a positive business impact. They are up to 62 reviews with 61 being five-stars and one four-star. That one four-star review still bugs Vince and his wife because although they acknowledged that nobody is perfect, they could not have done anything more than they already had for that person and his experience. Vince says that 2120 is the only archery tag place around; others are starting to pick up the idea but have not fully developed the concept. And while the company has grown much in a short time, Vince has not let go of his day job. His company sets up trucking companies with gas cards and fuel programs. He hopes to make 2120 his full-time job, but first a few more details need to fall into place. Since they only have the building on the weekends, they have had to turn down business for companies interested in team building play during the week. “If we could find a good 5,000-6,000 square-foot building, that is where we want to be,” Vince says. At 2120, they have started a tournament interest list. Participants need to be a minimum of 8 years old. Vince says that children younger than that age have a hard time holding and shooting the bow, and they cannot defensively protect themselves. Nevertheless, he soon plans to have Nerf wars for children. As I signed my waiver and proceeded into the training area, I did not know what to expect. I have never shot a bow in my life, but Vince came over and briefed me on the game rules and techniques for firing and reloading the bow. After a few practice shots, I was surprised how easy it was. Once I felt comfortable enough, my brothers and I were split into teams along with some other people our age whom we did not know. The game is much like dodgeball. Many of the same rules apply; instead you just have bows and arrows. I stare at my brother. I cannot wait to try and shoot him. As the whistle blows, I sprint into the center, scoop up as many arrows as I can and then get to cover quickly, because some of the experienced players are targeting me. I hear arrows whisking by the barrier and even hitting them. I peek my head out to return fire and narrowly miss hitting my brother. As Vince told me in training, the person who reloads quicker has the advantage. As we traded fire, we needed to resupply on arrows, which meant leaving the safety of cover. As I was trying to get an arrow, I was hit in the leg and had to sand off to the side until one of my teammates could bring me back in. My brother Adrian was able to catch an arrow off of his chest and get me back in while taking one of their players out. Back in the game, we start to press the other team with our numbers advantage. I take the center and am flanked by my teammates. We all focused on getting my younger brother Alex out. The barrier can only do so much when you’re being shot from all sides. We eventually hit him, and only Vince Jr. is left. Having played a lot of archery tag, Vince was hard to get a clean shot on, but having the three on one advantage was too much for him, and my team was able to take the win. 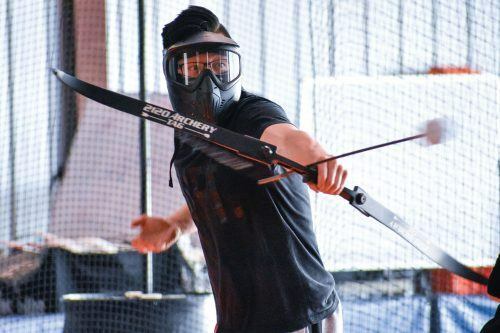 2120 archery tag, adrian acosta, alex acosta, andrea amaya, brackett airport, brooklyn amaya, gabriel lazo, kelly o'connell, kyra amaya, local businesses, madison amaya, recreation, vince amaya, vincent amaya jr.